Newsquest title the Northern Echo has announced an investment of £10,000 as part of a campaign to try and ‘save’ Darlington Football Club. The newspaper reports that “the money will be used to buy shares in new company, Darlington FC 1883 Ltd, which hopes to purchase the Quakers and prevent it from being liquidated”. Peter Barron, editor of The Northern Echo, said: “The paper has been at the heart of the campaign to save Darlington Football Club from the outset and we have decided to make this investment as a further demonstration of our support. “These are challenging economic times for all businesses and we recognise the sensitivities of making this investment. However, as Darlington’s local paper, we felt it was something we had to do. Darlington Football Club is an important part of our business, supporting sales of the paper, and it is an investment on behalf of our readers. This entry was posted in Editors' pick, Newspapers and tagged football club, investment, Newsquest, northern echo on February 20, 2012 by Rachel Bartlett. An unsigned editorial that appeared on the pages of the Streatham Guardian and Wimbledon Guardian calling for the return of capital punishment does not represent the views of publisher Newsquest and was “just a bit of fun”, the papers’ group editor said this morning. Speaking to Journalism.co.uk, Andy Parkes denied the editorials represented the views of Newsquest or Newsquest’s parent company, Gannett. Parkes said the piece was “tongue in cheek” and “a bit of fun”, and had been “blown out of all proportion” in a post by the Guardian’s Roy Greenslade this morning, which initially claimed that the piece had been run across Newsquest’s South London Guardian series and elsewhere. Parkes refused to comment on who wrote the piece at first, but later said: “You can put my name to it”. Pressed over whether he was the author, he refused to say any more, adding: “I absolutely don’t want to get into this any further”. 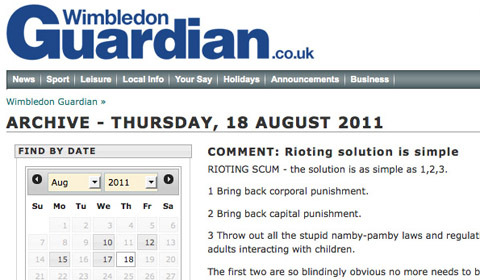 The hard-line leading articles – one of which was headlined simply “Rioting scum: the solution is as simple as 1, 2, 3” – call for capital and corporal punishment to be brought back in the wake of the recent rioting and looting. RIOTING SCUM – the solution is as simple as 1,2,3. 1 Bring back corporal punishment. 2 Bring back capital punishment. 3 Throw out all the stupid namby-pamby laws and regulations which actually stop adults interacting with children. The first two are so blindingly obvious no more needs to be said. The third is equally sensible – allow parents to discipline their offspring as they need to, put power back into the hands of teachers and actually encourage, not discourage, adults to be involved with children. Personally I’d ditch CRB checks altogether – after all, if you use points 1 and 2 correctly they would be far more effective than any CRB check could ever be. And, as for the suggestion an adult shouldn’t be allowed to carry other people’s children in the car… blah, blah, blah unbelievable. It’s no wonder adults are are terrified to get involved. I heard the other day that teachers are now discouraged from even raising their voices – the world’s gone mad. Of course, if you’re looking for a more radical solution. One idea would be to simply arm pensioners. On the same day you get your bus pass you receive a handgun and the legal right to use it. Those in post office queues might be a bit more jumpy, but I guarantee we’d have a new-found respect for the elderly. As well as appearing in print in the the Wimbledon Guardian and Streatham Guardian, the piece appears to have been published on the websites of the Lewisham and Greenwich News Shopper, Surrey Comet, Waltham Forest Guardian and Watford Observer, and Wandsworth Guardian. This was due to a “technical complexity” that meant content was syndicated automatically within London, a member of staff at the Wandsworth Guardian said. This entry was posted in Local media, Newspapers, Press freedom and ethics and tagged editorial, greenlade, Local newspapers, Newsquest, regional media, streatham guardian, Wandsworth Guardian on August 19, 2011 by Joel Gunter. Newsquest journalists are not exactly being encouraged to use Twitter and other social media, according to the company’s new social media policy sent to employees today (9 August). The policy advises “the internet is provided primarily for business use” but the company recognises “employees participate in social networking on websites such as Facebook, Twitter, MySpace, Bebo and Friendster”. No kidding. It seems a pretty standard policy for local newspapers, such as one I seem to remember Johnston Press sending out when I worked for the company a couple of years ago. JP even went as far to ban the use of mobile phones in the office, resulting in most reporters quietly ignoring the rule for the sake of gathering stories. The statement shows the company fails embrace the power of social media as a source or for traffic referral. The statement should be reassuring both journalists and sales teams that they don’t need to hover their mouse over the minimise icon of Tweedeck in case the editor walks by. Newsquest’s statement does state “exceptional circumstances may apply” when journalists can use social media for “editorial research”. Presumably any Newsquest journalist reporting on the riots may be permitted to look at Twitter today. But what about checking the WI’s Facebook page for details of the next coffee morning? Could you argue the case as exceptional? Hardly encouraging, is it? And where the social media policy is restrictive, it is not helpful in offering guidance. How about “don’t tweet anything you wouldn’t say if representing the company on the radio” or “be sensible in your use of social media”? Newsquest’s full social media policy is below. Presumably whoever wrote it is unaware that they are using the Twitter standard of asterisks to denote *emphasis*. UPDATE: Newsquest has responded explaining that this social media policy is better described as “some HR ‘acceptable use’ advice. Roger Green, managing director of digital media at Newsquest, sent a statement explaining the company has a ‘social media best practice for journalists’ document available on its wiki. Our social media best practice guidelines have been promoted in a number of well-attended training workshops run over the past few months by my heads of editorial and audience development. The most recent of these was just three days ago in Basildon where it was stressed that the effective use of social media is part & parcel of modern journalism. These promotional efforts, along with the energy and enthusiasm of Newsquest journalists have generated a growing number of cutting-edge story-telling successes. Company’s existing policy on email and internet use. photo-sharing sites, blogs, web forums and other associated websites. * during the one-hour break at lunch. The Company reserves the right to restrict access to these websites. with the employee’s primary job responsibilities. and clients of the Company. company in a professional manner. social networking sites in relation to the Company. staff without obtaining their express permission to do so. regard to copyright and plagiarism. gathered on employees’ use of the internet for a period of one year. private. Employees should never send abusive or defamatory messages. Privacy and feelings of others should be respected at all times. language which could be deemed as offensive to others. Company on any social networking website. instances under the Equal Opportunities and Dignity at Work policy. will be applied. Please refer to the Company’s Disciplinary Policy. This entry was posted in Social media and blogging and tagged Facebook, Newsquest, social media, Twitter on August 9, 2011 by Sarah Marshall. Journalists at Newsquest titles in South London will go on strike for four days next week, from Monday 27 to Thursday 30 June. The announcement follows a two-day strike last week. Staff are in dispute with the publisher over plans for a reduction in editorial space, redundancies across all sections of editorial, a review of a two per cent pay rise and an office relocation. NUJ mother of chapel Thais Portillo-Shrimpton said today that staff had not heard from management since last week’s strike. At the end of May, union members Newsquest titles in the area, which covers Surrey, Sutton and Twickenham, voted almost unanimously for strike action, with 22 out of 23 returns of a ballot in favour. Staff have also been working to rule since 15 April. Earlier in May the company announced 12 job cuts at a series of titles in the area, including the loss of the sports and leisure department at one of the South London offices. Staff are running a strike blog which can be found at this link. This entry was posted in Business, Job losses and tagged industrial action, Jenny Lennox, National Union of Journalists, Newsquest, newsquest south london, nuj, regional cuts, strike action, Thais Portillo-Shrimpton on June 20, 2011 by Joel Gunter. Journalists at titles within Newsquest South London have announced that their planned strike action will take place on Wednesday and Thursday next week (15 and 16 June). The strikes follow a dispute over redundancies, a reduction in editorial space, a review of a 2 per cent pay rise and an office relocation. At the end of May Journalism.co.uk reported that members of the National Union of Journalists at Newsquest South London voted in favour of strike action, with 22 out of 23 returns of a ballot in favour. Staff at newspapers in the area, which covers Surrey, Sutton and Twickenham, have been working to rule since 15 April. Earlier last month the division announced 12 job cuts at a series of titles in the area, including the loss of the sports and leisure department at one of the South London offices. This entry was posted in Job losses and tagged industrial action, National Union of Journalists, Newsquest, redundancies, South London, strikes on June 9, 2011 by Rachel Bartlett.